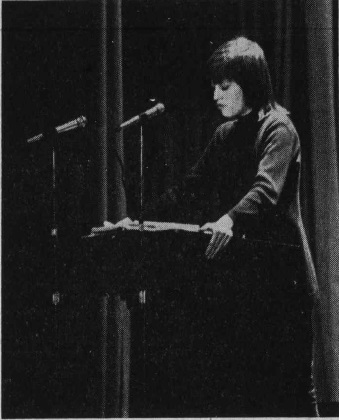 The 1970s saw a number of feminist speakers come to the campus of Madison, some famous, others relatively unknown outside their respective fields. Many these speakers were brought to Madison thanks to the efforts of the Madison Women’s Caucus, which, through its excellent Dominion Lecture Series, brought many intelligent female speakers to the campus that would not have spoken here otherwise. The importance of the efforts of the Caucus cannot be overstated, because a large number of the feminist speakers that visited the campus during this period, and in fact, in the future, would not have come without the work of those involved with the Caucus. The importance of feminist speakers themselves on a campus such as Madisons’ can also not be overstated, because feminist speakers can be the root of feminist thought in relatively conservative campuses, especially those in the south. The presence of such famous figures as Jane Fonda and the less familiar faces brought by the caucus, such as Margaret Brewer, allowed women (and men) on campus to engage themselves with feminist ideas that may have not been available to them through other sources. Bonnie Angelo, November 20, 1976. Margaret Brewer, November 12, 1979. Isaac Asimov, October 6, 1977. Humphreys, Frank and Geri Burrows. “Jane Fonda Appears at Madison; Anti-war Views Predominate.” Genesis II. Februrary 19, 1971. Amann, Sandy. “Carter: ‘personal understanding of ordinary people’.” The Breeze. November, 23, 1976. Elmore, Cindy. “Woman breaks stereotypes as Marine general.” The Breeze. November 16, 1979. Richardson, Tammy. “Feminism will save society.” The Breeze. October 11, 1977. Control #: Guest01, JMU Historic Photos Online, Special Collections, Carrier Library, James Madison University, Harrisonburg, Va.